This set includes a pair of four piece white plastic stanchions, with the pieces being a round base 14 inches in diameter, a post measuring 39 inches and being 2.5 inches in diameter, C-hooks to attach the chains to and a ball top. Also included is 16 feet of plastic chains, with the design promoting easy attachability. 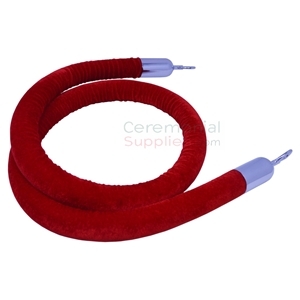 This red stanchion rope makes for an excellent companion piece to a set of polished steel or polished brass stanchions. Its attractive red finish and options of polished brass and polished steel rope ends only accentuate its luxury. The rope measures 6 feet in length, 1.5 inches in width, and is made of velour for a velvet like finish. 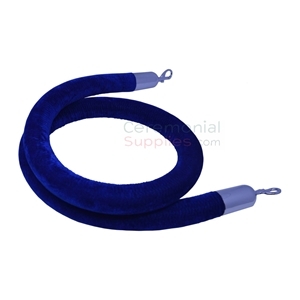 With its royal blue color and manufacturing of velour (velvet-like material), this 6 feet long and 1.5 inch wide rope will make for an excellent companion purchase to a set of stanchions. The rope ends come in two options, polished brass and polished steel to be matched with the corresponding stanchion. Your purchase will include a pair (2) of black stanchions with a base that measures 14 inches in diameter. The post measures 39 inches in terms of height and has a diameter of 2.5 inches. The post has a ball top design, and features C-hooks to attach the chains to. 16 feet of plastic chain comes included with your purchase. 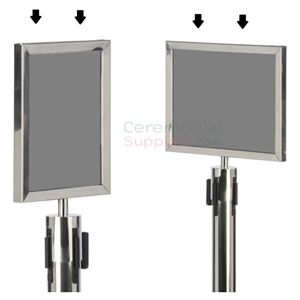 Stanchion Sign Frame is made of stainless steel with a chrome finish. Sign frame is two-sided with easy top insert and clear acrylic protective lenses. You can choose from Landscape or Portrait orientation. They are available in sizes 7 X 11 in., 8.5 X 11 in., or 11 X 14 in. Attachment cup has 4 slots that easily lock into our 4-way stanchion adapter top. Matches perfectly with our Chrome retractable stanchions. Crowd control equipment plays an important role at any major event, but when it comes to grand openings, ceremonial stanchions and rope are more than just crowd control tools. Grand openings and groundbreaking ceremonies rarely have the type of crowd that grows out of control; in its place is a crowd looking for reasons to be impressed by your organization. That is why ceremonial stanchions and rope are used on stage to hold the ribbon and decorative bows at both ends. The type of stanchions you use will say a lot about the caliber of your organization. Classic metallic stanchions with a golden or chrome finish are the default option in terms of luxury, but you can always accessorize to match the rest of your decor. There are colorful stanchions that match your company’s colors to perfectly complement the ribbon and scissors. Add elegant stanchion ropes to the set and you will create a majestic throne to surround the MVPs of the ceremony. 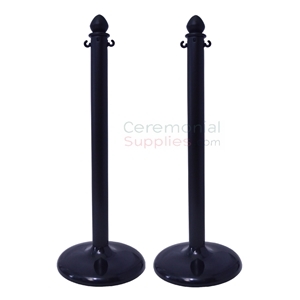 At CeremonialSupplies.com, you can coordinate the picture perfect look for your grand opening ceremony or groundbreaking with ceremonial stanchions and rope that go beyond crowd control. A grand opening stage is no line at the bank. The stanchions and rope used at these events should resemble something out of a classic opera theater; something with an upscale feel that will let guests know your opening is something special. Ball top stanchions are an example of the classic look that does well at upscale grand openings. These are probably best for ribbon cuttings held at galas or at prestigious venues where the crowd expects the event to exude luxury. Of course, these are not limited to these situations because you can always re-create that classy environment wherever you desire. With the right decor, the right ceremonial supplies and even the right lighting, any event can feel like a presidential gala. Another classic type of stanchion is the urn top design. While it looks more modern that the timeless ball top, the urn top stanchion is right “up there” in terms of elegance and decorative potential. The design maintains the cylindrical shape all the way through with the top being finished by a slightly wider urn shaped cap. It comes right after right after the sturdy ring that makes it possible to connect elegant stanchions ropes. Based on your needs, stanchions may be more convenient for you if made from different materials. The higher end stanchions—such as the ones used in upscale events—tend to be made from stainless steel with a chrome finish or brass. These metals have a beautiful shine and they are quite solid. Because metal stanchions are often used for actual crowd control, each one will weigh in between 20-25 lbs. which may not be ideal if you need to relocate them constantly. What is the best alternative? Plastic stanchions. Just because they are made from plastic, it does not mean that the look of the product is cheapened. Plastic is a perfect replacement for metal because is also durable, it resists wear and tear (given the case you actually use it for them for crowd control), and best of all, plastic is lightweight. Plastic stanchions have the option of serving as mere decorations (comes in handy when it comes to grand opening decor) but you can also fill them with gravel or any other heavy material, and they will instantly become as sturdy as metal. The best part is that they serve the same purpose as metal when properly used and they can be accessorized with quality stanchion ropes in beautiful colors. 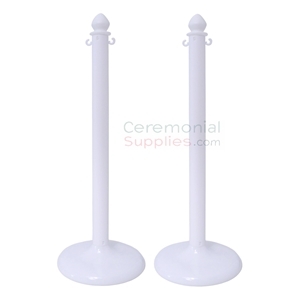 CeremonialSupplies.com is the best place to find stanchions and rope specially selected or grand openings and groundbreakings. 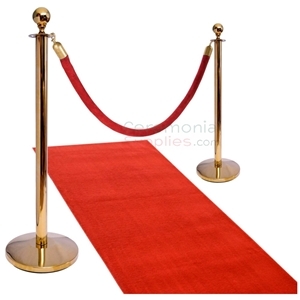 Stanchions and rope are the perfect companion to a red carpet. Be sure to check out our selection of related ceremonial products to make your event complete. Contact us at info@ceremonialsupplies.com or by phone at 1-877-373-4273.